The Indemnity Ordinance of 1975 which protected the killers from legal action. This past week has been one of celebration. The news media have provided rigorous coverage. The people have expressed their gratitude through milad mehfils and other occasions of thanksgiving. Most surprisingly and significantly, our political parties have, for once, agreed on something. No one can deny that justice had to be done in the case of the killing of Bangabandhu Sheikh Mujibur Rahman and 21 members of his family and household, including children and pregnant women. Yet, this very justice was denied by everyone who ever had the power to do anything about it. According to legal experts, in most of the political killings in our history, a part of the State was involved, for which reason it was difficult for the other parts to take action against them and thus have the legitimacy of their own power questioned. Those who came to power after the killings on August 15, 1975 are said to have been the beneficiaries of the crime and so, naturally, they were not the ones bearing placards demanding justice. 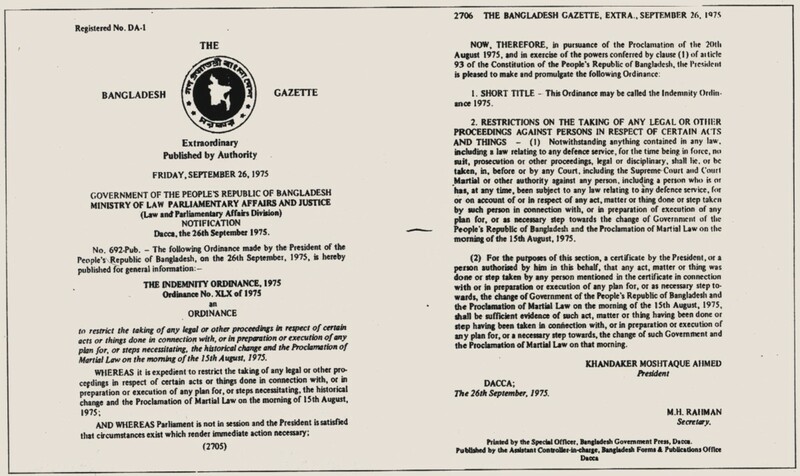 On the contrary, in September 1975, the government under President Khandaker Mostaque Ahmed promulgated the Indemnity Ordinance which restricted ’the taking of any legal or other proceedings in respect of certain acts or things done in connection with, or in preparation of execution of any plan for, or steps necessitating, the historical change and the proclamation of Martial Law on the morning of the 15th August, 1975’. The ordinance, which basically prevented anyone from taking legal action in the case, was later legalised in parliament. There was no scope even to question the immorality of the act, which essentially barred the process of justice. Justice has finally been served in one of the most brutal murders in our history. No successive government, military or democratic, took any steps to repeal the Indemnity Ordinance of 1975 or try the killers of the Father of the Nation. The culprits roamed free and even took credit for their crimes. In an interview with the Sunday Times on May 30, 1976, Syed Farook Rahman, said to be the mastermind behind the killings, said, “Let the Bangladesh government put me on trial for the assassination of Sheikh Mujibur Rahman. I say it was an act of national liberation. Let them publicly call it a crime.” He even cited five reasons for which he “ordered” Mujib’s killing. When the killers were finally forced to face up to their crimes, however, albeit 21 years later, the bravado faded. Despite all the evidence to the contrary, they denied responsibility. The chain of reactions which Farook and his accomplices set in motion did not end there. The struggle for power, the coups and counter-coups and killings continued, so much so that veteran journalist Anthony Mascarenhas, who followed the liberation struggle of Bangladesh and the chaotic years which followed, has termed it Bangladesh’s "legacy of blood", beginning from the partially flawed leadership of Sheikh Mujib which set off the killings in the first place. The same killers who on August 15, 1975 murdered Bangabandhu Sheikh Mujibur Rahman and his family, also assassinated four national leaders — Syed Nazrul Islam, acting president of the government-in-exile, prime minister Tajuddin Ahmed, finance minister M Mansur Ali and minister for home affairs, relief and rehabilitation AHM Qamruzzaman — inside a prison cell, on November 3, 1975. The latter massacre was a part of a contingency plan in the event that a counter-coup occurred, basically, to wipe out a whole leadership whom the killers did not see fit to govern the nation. On May 30, 1981, President Ziaur Rahman, who ultimately came to power after the coups and counter-coups of the 1970s, was assassinated by a faction of army officers, in approximately the 20th coup attempt against Zia himself. The killing of Brigadier Khalid Musharraf, Colonels Huda and Haider in November 1975, as well as the execution of Col. Abu Taher by Zia and the hasty trial and punishment of Zia’s own killers, were also said to be politically motivated. Political violence and assassinations in order to eliminate opposition and rise to power have spilled over into our recent history. Some have wiped out a whole leadership. Others have stifled opposition and thwarted differences. The killing of Salim and Delwar, Raufun Basunia and Nur Hossain, among others, during the Ershad era; the bomb blast at a Communist Party of Bangladesh (CPB) meeting in 2001 which killed seven people and injured over a hundred; the killing of Jatiyo Samajtantrik Dal (JSD) leader and freedom fighter Kazi Aref in 1999 and the violent deaths of Awami League (AL) leaders Mumtazuddin Ahmed and Manzurul Imam in 2003 and AL lawmaker Ahsanullah Master in 2004; the 23 people killed in the August 21 grenade attacks and the killing of former finance minister SAMS Kibria only six months later — the cases are endless, but justice has been served in few. In the case of the killers of Sheikh Mujibur Rahman and his family, not only were they not punished for their crimes, but they were actually allowed to escape and even rewarded by the State with positions of prominence such as diplomatic postings abroad. But it was only when Sheikh Mujibur Rahman’s party, the Awami League, headed by his daughter, Sheikh Hasina, came to power in 1996 that the Indemnity Ordinance of 1975 was repealed and the process of justice initiated. A murder case was filed in October of that year by a member of Sheikh Mujib’s staff at the time who had delayed the action all those years for fear for his life. In November 1998, 15 army personnel were handed down the death sentence in a trial court, of which 12 of the death sentences were upheld by the High Court in April 2001. The convicted were: Syed Farook Rahman, Bazlul Huda, Shahriar Rashid Khan, Mohiuddin Ahmed, AKM Mohiuddin Ahmed, Khandaker Abdur Rashid, Shariful Haque Dalim, AM Rashed Chowdhury, SHMB Noor Chowdhury, Abdul Mazed and Risaldar Moslehuddin Khan. The first five were in custody and later appealed the verdict. The latter seven were absconding and are currently rumoured to be moving between countries like the US, Canada, Libya, Pakistan and Kenya. The process was again stalled during the rule of the Bangladesh Nationalist Party (BNP)-led coalition government from 2001 to 2006. Further delays were caused by judges frequently embarrassed to hear the case, thus avoiding their responsibilities. In September 2007, during the reign of the caretaker government, a three-member Appellate Division bench allowed five of the convicted to appeal the High Court order. The hearings began last month. Last week, the long-awaited verdict rejecting the appeals and upholding the death sentences of all 12 of the convicted was announced. The execution process has begun, while the verdict is under review and will be carried out following the presentation of a mercy petition to the president. For those who have been absconding and did not appeal the High Court verdict, steps will be taken to find and bring them home. Following the verdict, the law minister during the time of the BNP-led coalition rule and currently a standing committee member of the party, Barrister Moudud Ahmed, said that the nation ’heaved a sigh of relief at the verdict’. The Jatiya Party said that it was a major step forward in the establishment of rule of law in the country. The Jamaat-e-Islami, a member of the BNP’s four-party alliance, declared its respect for the judgement of the highest court. Yet all these parties and key political players did nothing to bring about this verdict or to even initiate the process during their tenure in government. The AL in its first term began the trial proceedings, and now in its second term has seen the final judgement passed. If the AL never came to power, would justice never have been done? As positive as this verdict may be, what does it say about the legal and judicial system of our country and the sense of justice in general? Will justice only prevail for those in power and will the system always sway along with the political circumstances? Will those who are faced by injustices every day never be vindicated unless they are politically powerful? If such high profile cases take over three decades to be resolved, what of those which do not even make news headlines? The government’s promise to try the perpetrators of the jail killings, the August 21 massacre, the attack on SAMS Kibria and the BDR mutiny is encouraging. But let justice not be limited to those cases which only affect the party in power. The list of pending cases is long, dark and complex, starting from former president Ziaur Rahman’s killing, which the BNP itself, for whatever reason, failed to settle. This judgement is indeed a historic one. It brings closure to a long drawn out and bloody chapter in our history, which had set the unfortunate precedent of killers getting away with impunity. It also sets in motion a long overdue process of healing of a brutalised national psyche. Let us hope that it is also the beginning of a new chapter of doing justice in all cases in our past and future, regardless of who holds power and who the beneficiaries are. The word justice is stripped of all partisanship and leanings and implies ’the quality of being just’; let our justice system also be so. AT last all the road-blocks to indemnify the nation from the torment and tribulation caused by the assassination of the Father of the Nation have been removed. The five-member Appellate Bench of the nation’s highest court has unanimously announced its verdict, upholding the ultimate sentence handed down some nine years ago by the High Court to twelve self-confessed killers of Bangabandhu and members of his family. The tragedy of epic proportion happened some 34 years ago, not only annihilating the architect of our nation but also setting the stage for a reverse journey of the nation and undoing all the values and virtues which had crystallised through two-decades of tireless struggle for Bengali nationhood culminating in the great War of Liberation. In my own reflection, the most shattering moment of our national life was the tragedy of August 15, 1975. It was a Friday, I had just come back from the University (in USA) after defending my Masters’ thesis when the provost of my hall gave me the news of the tragedy. I was distraught and tried to understand whether this tragedy was tantamount to the denial of the merits of our causes for which three million of our people met martyrdom. Was I one of those who were misled by the leader to fight for the causes, which were proved to be no causes within a span of 44 months? What could I have replied when Pakistan’s ambassador to Washington said to me: "At last you Bengalees have realised and corrected your mistake?" In 1984, I had an occasion to meet one of the convicts in a foreign land when he was posted as a diplomat to our embassy. When he introduced himself I refused to shake his hand, telling him flatly on his face the reason for my not shaking his blood-soaked hand. I also take a bit of solace from my role, along with thousands of my compatriots in Canada, in sending one of the convicts, A.K.M. Mohiuddin home in the face of his impending asylum to Canada when he was deported from the United States in June 2007. Mohiuddin’s family members misled the media and his lawyer by a sensationalised appeal that he would be taken to the gallows right after he landed at Dhaka Airport. His lawyer argued in the media that "the judicial system in Bangladesh was corrupt and the trial of Mohiuddin was conducted in a kangaroo court while his government appointed lawyer never contacted him." Over the long span of 34 years, though the blood of the victims had long dried up, the tears of the millions who were fortunate to live through the day never ceased to remain fresh. The perpetrators and their obvious beneficiaries never believed that this day would ever come, and tried in all their ways to prevent this moment from arriving. After the infamous indemnity act was dissolved in the parliament, trials of the self-confessed killers were held in the Session Court, and the sentences were subsequent re-confirmed by the High Court. In February 2002, the then foreign minister of Bangladesh visited Montreal to meet his party’s local supporters. In the congregation, a local reporter asked the minister if his government had any plan to bring home the absconding convicted killers of Bangabandhu. The minister flatly answered no, since, in his opinion, his government had other important pressing priorities. In their tenure, the minister kept his words and no effort was ever made to open the death reference in the Supreme Court and consequently no endeavour was made to bring any of the fugitives back to the country. A very similar sentiment was echoed by the then law adviser of the last CTG, Mainul Hossain, when he commented (June 2007) vis-à-vis the demand for holding the final phase of the trail: "The case is an old one and political in nature, dating back to 1975, and something that is not on the list of priorities of the caretaker government." Defying all odds, the day has at last come where truth and justice have triumphed over distortion and injustice, the dignity of the judiciary has triumphed over frustration, the optimists’ assertions have prevailed over the pessimists’ apprehensions, and the nation is the on verge of indemnifying itself from its long-haunting nightmare. Let the dispensation of justice upholding the rule of law become the rule of the day and not the exception and, most of all, let the nation vow at this auspicious moment in history to start afresh and resurrect the lost defining values and virtues that went down with the Father’s assassination. Dr. Mozammel H. Khan is the Convenor of the Canadian Committee for Human Rights and Democracy in Bangladesh. THE judgement that the Appellate Division of the Supreme Court delivered on the case related to the killing of Sheikh Mujibur Rahman along with several members of his family on August 15, 1975, which upholds the High Court’s death sentence against 12 former members of the army, could very well be said to have untangled a historical knot and is indeed welcome. If the killing of Sheikh Mujib and several members of his family, including women and children who had no role in his government’s decision making, were gruesome, the failure of the state to bring the killers to justice for so many years had been shameful. Thus, the verdict does relieve the nation of its collective sense of guilt and shame. Importantly still, it restores the nation’s credential as an aspirant for establishment of the rule of law, which is the prime prerequisite for democratisation of the state and society; after all, it is unthinkable in a democratic dispensation that the murder of a president, that too the founding president of a republic, would remain untried and unpunished for so many years. Moreover, it promises to set in motion a process of reconciliation of the political class in particular and society in general, which have been divided down the middle over the killing. The intense and intractable political divisiveness over the issue has also precluded the possibility of wholesome growth of the country and economic emancipation of its teeming millions. The verdict, one may hope, will set in motion the much-needed process of reconciliation within society and consolidate the nation’s endeavour towards establishment of the rule of law and democratisation of the state and society, which, in turn, would result in equitable economic prosperity for the people. That the people generally want to move on is implicit in the absence of any visible opposition to the verdict by any organised groups – social organisations, political parties or otherwise. We believe it is an indication that the verdict generally resonates with the public sentiment and that there is a pervasive willingness to redress the political divisiveness and work towards establishment of the rule of law and democratisation of the state and society. One of the positive aspects of the trial was that the accused had been given ample time to explore all available avenues to present their cases. True, the trial has taken an inordinately long time; however, one must agree that thus far all possible legal options have been exhausted in the process and the law has been allowed to take its own course. The Awami League-led government certainly deserves credit for not trying to hasten or subvert the legal process at any stage. Hopefully, with justice delivered, albeit belatedly, the people will feel reinvigorated to put the past behind them, look forward and work towards politics of unity. Here, the AL-led government has a moral responsibility to play a decisive role. It needs to realise that the verdict of the Appellate Division itself does not mean that the rule of law has been established in the country; it has only heralded the beginning of a process that will be arduous and tortuous. The government needs to take the process forward with decisive and demonstrative actions against any kind of undermining of the rule of law. In other words, it needs to make sure that even the vilest of criminals are afforded the opportunity to defend themselves in the court of law, instead of being killed in the name of ‘crossfire’ or ‘encounter’. The process of bringing to justice the killers of former Bangladesh President, Sheikh Mujibur Rahman has received a boost with the country’s Supreme Court upholding the death sentence awarded by a lower court to five of them. Sheikh Mujib was assassinated barely four years after he led his people to freedom from Pakistani rule. Almost his entire family was wiped out in the massacre. His secular beliefs and close ties with India prompted his killers to eliminate him. The Supreme Court decision upholding the death sentence to the assassins has taken Bangladesh 34 years to reach this point. Successive governments, especially those led by the generals and the Bangladesh Nationalist Party, did their utmost to protect the killers, even rewarding them with diplomatic assignments. It is the persistent campaign of secular Bangladeshis and the determination of the Awami League that has resulted in the verdict. However, only two of the killers are in the governments custody. The whereabouts of the others are not known. They are rumoured to be living in Saudi Arabia, Pakistan and Libya. Unfortunately, Bangladesh does not have extradition treaties with these countries. Whether they will admit to the sanctuary they have provided the assassins remains to be seen. The death sentence to Mujibs killers will provide hope for those who are anxious to see the 1971 war criminals brought to justice. They participated in the mass rapes and massacres against their own countrymen. As in the case of the Mujib murder, the collaborators — many of them belong to the Islamic parties and were allies of the BNP government — have been roaming free for almost four decades. An early attempt to try the war criminals was snuffed out with the assassination of Mujib. Last year, a platform of 1971 war veterans revealed that 11,000 indicted war criminals were released from jail a few months after Mujib’s assassination. Clearly, there is a link between the war criminals and those who wanted to see Mujib dead. The sentencing of Mujib’s killers must be taken to its logical conclusion. The wounds inflicted by the events of 1971 and 1975 are yet to heal. Justice will speed the healing process. It has been a long and agonising wait for Bangladesh. The judicial confirmation of the 1998 conviction of the killers of Sheikh Mujibur Rahman, the country’s founding father, signifies a historic turn, though one would have wished the court had stopped short of the death penalty and opted for life imprisonment. The bloodbath of August 15, 1971, when the ‘Bangabandhu’ was shot during a putsch, has haunted the country since then. It has taken no less than 25 years for the legal barriers — including the infamous Indemnity Ordinance promulgated first in 1975 — erected by successive military and civilian governments to shield the killers, to be removed. The breaking away of East Pakistan had represented a political and social revolution, and the operation sought to oppose the dominant role of the military in politics and discard the culture of communalism. The assassination was clearly a setback for the new nation. For Mujib signified the vision of a secular and progressive Bangladesh. A large section of the people considered the coup and the assassination as part of a sinister and determined plot to turn the nation away from the path of socialism, democracy, nationalism, and secularism. If Bengali nationalism was the guiding spirit of the liberation struggle, a form of Bangladeshi nationalism, with stress on religious identity, was being sought to be established. The most significant outcome of the Supreme Court’s verdict should therefore be a reaffirmation of the dream of 1971. If Sheikh Mujib’s death ended the first spell of democracy in the fledgling nation and set the stage for a series of foiled coups, his daughter’s comeback to power in the December 2008 elections, after many a twist and turn in the nation’s fortunes, was a triumph for democracy. But many tasks remain for the current leadership. In the immediate context these are two-fold: tracking down and bringing to justice the killers who are at large — at least seven of them may still be alive — and attaining a closure of the whole sordid issue. The fabric of civil society needs to be repaired. It is time for Bangladesh to turn the tragic and traumatic page and move on. The country owes it to Mujib, who was a unifying leader. It needs the salve of reconciliation and cooperation and has to come to terms with the imperatives of development. Prime Minister Sheikh Hasina, the latest winner of the Indira Gandhi Prize for Peace, needs to keep in mind the legacy she represents and take Bangladesh forward in tune with the founding spirit. THAT the killers of Bangabandhu Sheikh Muiib-ur-Rehman have been brought to book is the biggest compliment to the judiciary of Bangladesh. First the lower court, then the High Court and finally the Supreme Court have pronounced death sentence to 12 retired and dismissed army men. Understandably, Prime Minister Sheikh Hasina was “overwhelmed with emotion” after the verdict. She was abroad when her father, her mother and three brothers were killed in a coup on August 15, 1975. The credit of seeing the case to its ultimate end goes to Hasina and to her party, Awami League. They retrieved the case from the limbo 17 years ago when they came to power for the first time after the Sheikh’s assassination. It was a lower court which sentenced the culprits during her regime. Whenever the opposition, the Bangladesh Nationalist Party (BNP), headed by Begum Khalida Zia, came to power, it saw to it that the case would not move or move at a snail’s speed. The prosecution would stall the matter as if it did not want the culprits to be brought to justice. In fact, BNP secretary-general Khandakar Delwar Hossain confirmed the doubt by his churlish remark on the eve of the Supreme Court’s verdict. He said: “People of the country will certainly accept the final verdict of the Supreme Court. Where was the dispute about it?” The people of Bangladesh have been waiting for the sentence for the last 34 years when the person who led them to freedom was killed by the army. Hossain unnecessarily revived the debate over the responsibility for the delay in the judgment, and showed where he and his party stood. I was in Dhaka a few days after the assassination of the Sheikh and his family members. I went to Dhanmandi where they lived. The security men did not allow me to visit his home. But I could see how forlorn the place was. I could relate to the tragedy to the killing of Mahatma Gandhi at the hands of a fanatic Hindu. I had then gone to the Birla House where Gandhi lived before the assassination. Dhanmandi, like the Birla House, had an air of asceticism and spiritualism about it. Something touched me deep within. I remembered how only a few years earlier, I had interviewed the Sheikh. How buoyant and confident he was about the future of his country and outlined many plans to take the Bangladesh forward economically and socially. His emphasis was on the unity of the nation. I recalled the words he uttered at that time —Bangladesh belonged to its people, both Muslims and Hindus. This was the ethos of India’s independence movement too. Would the nation follow the Sheikh’s voice? Would his mission for unity be completed after sacrifice? At least these questions came to my mind. For the time being, I could see that the loss had fused the different religious communities. All constituted a nation in mourning. Now that the case relating to the Sheikh’s assassination is out of the way, the government at Dhaka should hold an inquiry into why the information conveyed by the RAW to the Bangladeshi authorities, that the Sheikh sahib faced the danger of assassination was not taken seriously. I believe some officers went from Delhi to discuss with the top officials in Dhaka at that time about the possibility of a coup and the elimination of the Sheikh. Probably, the accomplices of the killers or their influential friends did not want the warning to be taken seriously and did little to protect the Sheikh. Their negligence or complicity took away from Bangladesh the leader it wanted the most at that time. When I conveyed what Bhutto said to the Sheikh, his reaction was: “We have more resources than Pakistan; we have fish, tea, jute, gas, fruits, fertile land and a handy people. We shall soon be on our own. It is Pakistan which will have to mortgage itself to sustain the present level of spending.” How prophetic the Sheikh has turned out to be! However, Hasina has to make his dream about Bangladesh come true. While holding the probe into the circumstances that led to Sheikh’s assassination, one relevant factor that needs to be looked into closely is the supply of tanks to Bangladesh. India’s minister D P Dhar, who was the civilian face of India’s operation, had told New Delhi not to send tanks to Bangladesh. Who supplied the three tanks to Dhaka because the entire coup was carried out by the three tanks? I believe Cairo sent them. Why? Were the killers, senior army officers, involved in importing the tanks in one way or the other? The chapter does not close with the Supreme Court’s laconic judgment: “We find no cogent ground to interfere with the judgment of the high court” that had confirmed the lower court’s judgment. Sheikh Hasina’s government must strengthen the democratic forces in the country so that the freedom of people is not snatched away as it happened when the Bangabandhu was killed. Bangladesh had to suffer a long military rule which did its worst to destroy the values that were planted in the minds of people during the liberation struggle. Hasina has to hark back those days and reignite the spirit of togetherness which her father had fostered. This requires the participation of people in the governance. It is not beyond Hasina, who has won this year’s Indira Gandhi prize for peace, to do so. The above content is reproduced here in public interest and for education purposes. Non commercial use of the above material is intended.